In July 2001, Alabama Supreme Court Justice Roy Moore, in the cover of night, placed in the middle of a public courthouse foyer a two-ton granite display that ignited a firestorm consuming American politics and the national media for months. Lawsuits were filed, protests on both sides were organized, and the battle over this country’s destiny began. What could cause such an ill-tempered debate on the future of religion in American politics? The 10 Commandments of course! Actually, it’s hard to believe that God’s law, delivered to His people on their freedom tour of the Middle East, could cause such an outrage. Designed specifically to give humans a guide to peace and harmony on earth, it was turned into a smoking platform of anger and self-righteousness. Perhaps not since the Scopes trial of the early 20th century has America experienced such rancor over the state-church controversy. By the time the granite dust settled, the 10 Commandments had been removed from the court by the order of a higher justice; furthermore, Chief Justice Roy Moore was removed from office for unrepentantly defying the law of the land. Yet on the day of his expulsion, the passionate judge gave a warning to those who challenged his attempt to acknowledge God from his chair—he’d be back! And what he planned would change the course of American politics. Yet this is confusing: If the Commandments are no longer in effect, why are they, as Christians and Americans, trying to force them on every other citizen by displaying them as a government-sanctioned artifact? Also, if Jesus did away with them, can they really be part of a common Judeo-Christian heritage? Wouldn’t the most correct course of action be to post the two new covenant commandments of Jesus for a Christian nation? On the other hand, if the 10 Commandments were so important to this nation’s Founding Fathers, why should we not be compelled to obey them implicitly—every one of them, with or without the benefits of grace—if America is to return to its glorious roots? If the Founding Fathers established this nation on the pillar of the 10 Commandments, might they have reasonably expected them to be followed to the letter by likeminded Christian citizens? Some might label me unpatriotic because I feel it necessary to point out a fundamental flaw in the reasoning of the many Christians who want to see the 10 Commandments displayed in government institutions. Although my purpose is not to argue the details of why this nation was founded, I do believe that the United States plays a pivotal and wonderful role in God’s plan of salvation. As such, I love this nation as the gift from God that it is. My heart always soars with joy when I hear our national anthem. Yet whether or not “Christian” leaders established this country as a “Christian” nation is not the issue. Of course, the ideals of Christianity and Judaism should be the moral compass that guides the hearts of our leaders. Christianity offers freedom to every human being, just as the United States has a strong record of fighting for freedom throughout the world. However, I don’t think America is responsible for spreading God’s end-time message to the world. Rather, America is here to protect His church, so she can take the gospel to every people and nation. I believe this is why America has acquired such undisputable power, unprecedented in the history of the world. Its economical and political influence protects God’s last-day church from tyrant governments and unwanted political intervention, enabling it to freely spread the good news to people all around the world. God would surely bless such a nation. Some Christians boldly claim that they want the Commandments displayed as a way to get God back into America, in addition to prayer in schools and in Congress. But is that really safe? Is the government the right power to tell us what is right and wrong morally? Surely we are blessed that our laws reflect the basic principles of God’s Commandments; that’s a very real comfort to even non-Christians. But by separating church and state, we are assured that no religious power will have the authority to override the conscience of those who might believe otherwise, suppressing the religious beliefs of another church. Yet well-meaning but misguided Christians who want to smash the wall of separation of church and state will turn the blessings of this country on their head and lead America into a terrible disaster. Frankly, this nation hasn’t lost its way because the government or strident humanists seek separation of church and state, forbidding the government display of Commandments; it’s lost its way because more and more of her people’s hearts are seeking separation from God in their everyday living. It’s not secular government that’s sending this nation down the sewer of moral decay; it’s secularized hearts! Make no mistake; everything about the 10 Commandments speaks of religion. It just cannot be displayed as mere history, because any person who sees it, Christian or heathen, will understand its towering religious significance. It is so powerful that an atheist will feel its influence in a chamber of justice on the other side of the building and truly believe he has no fair shot because of his or her beliefs. And Christians need to understand this about God’s law: It is not just a statue to display in public, like a costume from a famous movie. It affects everybody’s lives, even the unbelievers’, whether they want it to or not. Likewise, every Christian acknowledges that the Commandments come directly from the hand of God. “And he gave unto Moses … two tables of testimony, tables of stone, written with the finger of God” (Exodus 31:18). They are religious laws, period. The government of man has no real power or mandate to enforce them—they are enforced solely by God’s omnipresence, universal power, and wisdom. And yet far too many Christians are secularizing their own hearts to God’s Commandments, believing the government plays a part in the task He has given to each individual. We should not attempt to use the government to spread God’s message—we should be using our own voices and the example of our lives. What example? Reflecting the spirit of the 10 Commandments. So as some clamor about the separation of church and state, they still yet deny with their hearts and mouths the ultimate authority of God’s law. They lift up the Commandments without any intention of honoring them completely—the very definition of a form of godliness without power. Shouldn’t Christians in this country be more concerned about obeying those Commandments than making them a historical display on the walls in our halls of justice? Shouldn’t we stop treating God’s law as an idol of government, but instead as the living, fulfilled testimony of Jesus Christ? Any healthy debate among Christians about God’s law must begin with how God Himself defines the terms. Without this step, it’s impossible to find a biblical consensus. Yet by letting God define our terms in this discussion, it won’t take long to realize that the evidence compelling us to obey His Commandments today, in the new covenant faith, is overwhelming. Here are 10 indisputable facts, or definitions, about the 10 Commandments from the Old and New Testaments—two witnesses, or dictionaries, of God’s message to humanity. God wrote the 10 Commandments. “And the tables were the work of God, and the writing was the writing of God, graven upon the tables” (Exodus 32:16). They are eternal, meaning they will not change or be erased. “All his commandments are sure. They stand fast forever and ever” (Psalm 89:34). They are perfect as they are. “The law of the Lord is perfect” (Psalm 19). If they were perfect, would their function or purpose need to change? We’ll die if we break them. “He poured out his life unto death … [bearing] the sin of many.” (Isaiah 13:9). Satan was first to convince a human otherwise. It is our job to obey them. “Fear God, and keep his commandments: for this is the whole duty of man” (Ecclesiastes 12:13). These first five points are taken from the Old Testament. Many of those who want to display the Commandments argue that the laws are an old covenant relic meant for the Jews, and Christians aren’t subject to them because they are outmoded in our relationship with Jesus. Although points 2 and 3 each seem to shatter this argument, we’ll see later from the New Testament that Jesus also denied the claim that the Commandments have been nullified. But first, this viewpoint contradicts one major reason given to showcase the Commandments in schools and other government-run institutions; that being, we have a government established on Judeo-Christian principles and displaying them is simply honoring that. If we live in contradiction to the Commandments, merely displaying them as a testimony of past government, it is hollow praise at best. We shouldn’t treat God’s law with such diminished value! But the New Testament, even after Jesus’ death, doesn’t regard the law itself any differently than the Old Testament. In fact, it is easy to conclude that the New Testament also affirms that God’s law is forever and ever. Breaking them is still wrong. “Sin is the transgression of the law” (1 John 3:4). Humanity still needs them. “I had not known sin, but by the law: for I had not known lust, except the law said, Thou shall not covet” (Romans 7:7). Obeying them is still a sign of loyalty. “If ye love me, keep my commandments” (John 14:15). They are still eternal. “It is easier for heaven and earth to pass, than one tittle of the law to fail” (Luke 16:17). Jesus exalted them! God established the law with His own voice; might it need Jesus’ voice to do away with them? Yet He never does, before or after His death! They are still perfect. “Think not that I come to destroy the law … but to fulfill” (Matthew 5:17, 18). Jesus did not change any part of them. 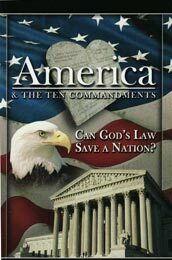 It’s clear that Jesus wants us to keep the laws of God—the 10 Commandments—and I believe He is dismayed at the hollow gesture of displaying them in our government halls and not in our outward lives. Jesus continued to call the Commandments “laws,” and He never defined them differently. So this next verse is a clear message: “Whoever shall keep the whole law, and yet offend in one point, he is guilty of all” (James 2:10). Of course, Jesus also obeyed them exactly the way they were intended, so Christians surely cannot conclude that they are not meant to follow them as Jesus followed them. Isn’t that what Christians are—a reflection of Christ? Now imagine if after several years, even as new drivers are getting licenses, the government begins to take down these very specific signs and replace them with “Drive Safely” signs. Years later, a new government decides the governor really meant that imposing specific speed limits is impossible for the average citizen today to reasonably obey while trying to get to work, get their kids to soccer games, and other everyday realities. (Even advanced safety features in cars seemed to make those laws archaic.) So they replace 70 mph speed limits with the “Drive Safely” signs and remove the penalties for exceeding them. Right below the new sign, they post, “Suggest 70 mph,” because most traffic engineers agree that 70 mph is the safest limit. That might be silly to imagine, but that is how Christians today are treating the 10 Commandments, a very specific set of rules based on two greater laws. Jesus said, “ ‘You shall love the LORD your God with all your heart, with all your soul, and with all your mind.’ This is the first and great commandment. And the second is like it: ‘Love your neighbor as yourself’ ” (Matthew 22:37–39). The specific speed limits hang on the greater commandment of drive safely, and without them a “Drive Safely” law would be useless to govern people. Anarchy would prevail! Why? Because humans can’t be trusted to figure out right and wrong in our selfish conditions. To paraphrase one modern-day philosopher, “Why are people who go faster than us dangerous and those who go slower than us annoying?” Right would always be what we wanted, and wrong would always be what we did not want. “There is a way that seems right to a man, but the ends are the ways of death” (Proverbs 14:12). Let’s reverse the scenario. What would have happened if God instead issued the two great commandments to Moses on the mountain without offering the 10 Commandments? The Bible tells us: “He that trusts in his own heart is a fool” (Proverbs 28:26). The world, influenced by sinful hearts and the deceptions of Satan, would quickly crumble. Sadly, much of the problem would be genuine believers foolishly thinking they could determine right and wrong without God’s explicit direction. In essence, it’s the same outcome if the 10 Commandments were ditched entirely for the two greater commandments. There is only one way to unify a group of believers from all different backgrounds and beliefs—one common creed. That creed is God’s plan for the universe, His Word, and that emphatically includes His 10 Commandments. Some well-meaning Christians also argue that the 10 Commandments should be displayed as “helpful suggestions,” and not laws that require penalty if broken. However, the problem is exactly the same! Without the danger of lawbreaking, and therefore the threat of a penalty, most people would freely violate the greater law. As mere guidelines, they are useless to create order—which is why the government will never remove specific speed limits. It is also why God has not done away with the 10 Commandments either. They still have a very legal and compelling interest in our lives. Many Christians utterly forsake God’s 10 Commandments but cleverly veil their disobedience behind these two great commandments. As such, men and women on their own define what it really means to commit adultery, what it really means to steal, what it really means to bear false witness, what it really means to honor the Sabbath, and what it really means to murder. Without the 10 very specific Commandments, it is much easier for “God’s people” to do terrible things in His name. It’s a slippery slope that can only be avoided by committing ourselves to His Commandments as recorded in the Holy Bible. Some Americans are concerned about the real threat of moral relativism—the notion that there are no moral absolutes—infecting the nation today. For example, euthanasia, legalizing illicit drugs, homosexual marriage, and abortion are the results of a people who have lost sight of God’s eternal principles. But by doing away with either the Commandments or the penalty surrounding them, they are far down the road to moral relativism, because they rely on humans feelings, and not God’s written law, to ensure morality. Unfortunately, the government’s refusal to legalize the imports shows real wisdom. Soon people start to get strange illnesses traced to the fruit, and some even begin to die. What’s worse, the fruit begins to infect genes and harm unborn babies. Sounds suspect, right? Who in their right mind would willingly continue to eat the fruit knowing that it destroys their body and their children’s lives? And most Americans who respect our laws would be outraged by such willing defiance and would not tolerate it. Unfortunately, these Americans treat God’s law the same way. Is it right to willingly eat the fruit even with the serum? Of course not, but some Christians think that because we have a serum, called “grace,” our sins are covered in even willful disobedience. Does it really make sense to continue to sin because we have His grace? God wants to blot out sins not only in our lives, but also from the universe—might we consider cooperating by committing to obedience? We must remember that there is a very fine line between admitting that we cannot overcome sin on our own and willful disobedience. Someday, the former will lead to the latter if we do not trust our Lord’s promises that He can help us obey God’s law (Revelation 3:21). The amazing thing is that the Bible says if we cling to Jesus, we will have victory. So I think the real question should not be, “Why are the Commandments so hard to obey,” but rather “Why am I finding it so hard to trust God’s promise?” Too often the phrase, “We can’t keep them,” really means, “God will forgive me anyhow.” That is presumption, and it is a dangerous game to play with the Almighty. That’s why one of the most passionate arguments fired against “Commandment keepers” is the same argument that convinces me that obeying them is really a matter of loyalty to Jesus. It’s been said that all we can do is believe, for we as sinful beings are unable to obey the law anyway. But this is really a chilling argument when you unfold its ultimate conclusion. It’s as if they are saying that all of those Bible verses about relying wholly on Jesus for salvation are actually saying we must instead be puppets possessed by Jesus. He must either overlook our sins with His blood or actually take over our bodies, choosing for us. But puppets don’t love Jesus, nor do puppets care or choose. Why should they? If we are puppets, why care about the law at all—or even Jesus—who is the Commandments, the Word, in flesh? Of course, the argument about simple belief is countered in the Bible. “You believe that there is one God. You do well. Even the demons believe—and tremble!” (James 2:19, emphasis added). Even the devil believes in the saving power of Jesus, but the Bible says he will not be saved. Which means it must require something that the devil and the demons don’t do! What could that be? It’s acknowledging God by choosing to live the pure lives He meant for us. He wants His people to be active participants in His plan for their lives. This surely begins with belief, a crucial step. But it must not end there. What does faith really mean without commitment? “Faith without works is dead” (James 2:26)! Should we treat something He came to die for so carelessly? Some say, “Even if I don’t want to sin, but do, it is covered under God’s blood.” Should we be so dispassionate and neglectful? I think the heartfelt plea is, “I will commit my heart to God’s Commandments as a testimony of His grace in my life. Should I stumble, He will lift me up.” But if we don’t do our best, should we expect Jesus to continue paying the price? The Word of God sums it up best as always: “Little children, let no man deceive you: he that does righteousness is righteous, even as he is righteous. He that continues in sin is of the devil; for the devil sins from the beginning. For this purpose the Son of God was manifested, that he might destroy the works of the devil. Whosoever is born of God does not continue in sin; for his seed remains in him: and he cannot sin, because he is born of God” (1 John 3:7–9). I have no doubt that most sincere Christians citizens would be angered by such disrespect for the institution for justice, yet these same Christians do not respect God’s government regarding time with Him in His chamber. They don’t show up when asked, and if they do, it’s often on another day and they don’t do the things asked of them. Many Christians exclude the fourth Commandment from the other nine as a law meant only for the Jews. Others say that it is still a Commandment to obey, but one that Christians should practice on the first day of the week instead of the last day. Others still argue that it doesn’t matter what day, as long as time is given to God. Yet can you ever imagine finding a judge who orders a trial on Wednesday to accept: “I showed up on Thursday! As long as I show up, does it really matter?” Of course, God will accept praise any day and time, and He will bless you for it. But this Commandment asks for your presence at a particular place and time! Why is it then that when a judge tells us to show up, we know we are breaking the law when we don’t and will suffer the penalty—but if the Judge of the universe asks us to show on a certain day, it’s really just our call? By ignoring or altering the fourth Commandment, it is no longer a relevant part of the 10 Commandments as written in the Bible—the inspired Word of God. Indeed, if it can change on the whims of a person, why not the others? But Jesus Himself emphatically said this would never be the case. “Think not that I come to destroy the law … but to fulfill” (Matthew 5:17,18). He also said not one part of it would change, not even if the earth and its people passed into history. It’s for all time and for all creation! In addition, He said the wording of the law would never change (Luke 16:17), which is what exactly has to happen if we are to accept that the first day is the Sabbath. Can you imagine changing a court summons date and passing it off as lawful? This becomes even more problematic when Paul puts a stop to the practice of circumcision, replacing the commitment, or altering it, with baptism (Colossians 2:11). His act of transforming the circumcision ceremony created a deep division in the church, yet we are to believe the transformation of the Sabbath did not? Many claim the fact that Jesus doesn’t vocally reinforce the Sabbath in the New Testament proves, from silence, that He must have not considered it important. But since He did observe the Sabbath, and because we see no Jewish outcry, the argument from silence works best the other way around. Indeed, Jesus often mentions a Commandment to add more meaning to it. It isvery possible that the light on the Sabbath in the Bible is sufficient, so He saw no reason to mention it. Of course, Jesus does mention the Sabbath while defending it from legalists (Matthew 12:1–12), and He honored the Sabbath by going to the synagogue, as “was his custom” (Luke 4:16). Would you consider yourself loyal to the government if you didn’t show up to a trial where your testimony could convict a terrorist? Why then would you consider yourself loyal to God if you failed to show up on a day He specifically asks of you? Still, this is an important concern, because the Pharisees treated God’s law in such a way that changed its nature, and Jesus rebuked them for it. They added religious pomp and circumstance to not only gain favor or merit with God (in fact, they really seemed to merit favor with people), but also to control the religion itself and His people (Matthew 23:15). But the Jews, or even Jesus, never questioned the Pharisees’ zeal for the 10 Commandments themselves, only that they had altered their purpose; loyalty to God’s law was a must for any Jew. In fact, Jesus told His followers that the standards set by the Pharisees was in fact too low to enable human access to heaven (Matthew 5:20). The Pharisees changed God’s law from a measuring stick to show us our need of God’s empowering grace into works that could get us into heaven. But this is not a real representation of what God meant for the Jews, who were always to be saved by grace in Jesus Christ. The New Testament tells us that it wasn’t works that made Abraham righteous; it was his faith in God’s promises. If he didn’t believe that God would do as He promised, his obedience would have been for nothing. Yet his works are considered a sign of his faith. Had he no works, no obedience, would he be remembered as the “father of the faithful”? Was the New Testament calling Abraham a legalist? (James 2:21–22). No. It was calling him a Christian—an early version, perhaps, but still a trusting, obedient Christian. Some believe that our relationship with God’s law changed with Jesus. But He came to cleanse us of our sins and give us the power to overcome them—not give us a free pass to sin more. Grace has always been God’s powerful gift, from Adam to the end of time. We should not take it for granted so easily, so cheaply. Sometimes I am told that I don’t understand grace because I choose to obey the Commandments as they are written. But my testimony is a life utterly transformed by God’s grace, which has in turn made me recognize the astounding beauty and necessity of God’s moral law. How could the Holy Spirit convict me of my desperate need to repent and accept God’s grace without His rules spelled out in detail? It’s not a long-gone artifact of faith, but an eternal testament to God’s righteousness! Realizing that my sins had been washed away, my love for God blossomed (1 John 4:19). Yet the more I studied His Word, the more I saw that sin devastated God’s heart. It was an unavoidable conclusion. I didn’t want to hurt Him any longer, or treat His law so lackadaisically. Grace has not only made me clean before the Father, it has enabled me to honor His Commandments so long as I cling to Jesus and His promises. When we show God our real desire to stop sinning, real change begins. We experience true character-building—a real goal to reach for—a real purpose for living; something that grace without real responsibility won’t give us. (If you give a jobless person a job and a living wage, you will see real passion! But what happens when all you do is give money and walk away?) And that is why I am so passionate for God. His law, His government, has given me purpose to live, to work, and to die for. God loves us. God has mercy. I count on that love and have faith in that mercy. I am aware of my sinful condition, but I have assurance that He is willing to forgive and that He will complete His work in me (Philippians 1:6). But I also believe He has a big problem with those who willfully defy His Commandments and pick and choose the details they will acknowledge. Can God allow someone into heaven who continues to recklessly defy Him? I think God would never want us to conclude that we love Him so much that we won’t worry about keeping His Commandments. “So speak ye, and so do, as they that shall be judged by the law of liberty” (James 2:12). Thus, God-fearing Americans don’t need the government to enforce the 10 Commandments, or have schools with prayer time. For all their days, the Jews had posted His moral law everywhere, and yet they still disobeyed and their nation crumbled. They were lost because their hearts rejected His laws, not because they didn’t display them. That should tell us something: A plaque in a government hall doesn’t honor God; that method was tried, and it failed. Of course, there is a big difference between that and forbidding biblical teaching in the public domain; this is the real issue Christians should fight for. Ensuring religious liberty does not mean forbidding expressing our faith; sharing our faith is a Christian duty! Yet nor does religious liberty mean forcing the faith on someone who doesn’t want to hear it. It is a sad fact that God’s influence is dying in the land, but the government can’t fix that. Only God can through the agency of His church. Instead of a Christian-governed nation, I believe there is an even a better way to promote peace, love, and Jesus in our country. Instead of raising an alarm when they are removed from government buildings, I believe we should hang the 10 Commandments in our own homes and on our hearts. If we honored them by our actions, it wouldn’t matter what the government did, because the hearts of unbelievers would be touched dramatically. Think of the stories of Joseph, Daniel, and of course our perfect example, God’s Commandment Keeper, Jesus. His life of love, grace, and perfection changed the course of history—no earthly government required.